A total of 42,411,194 Minor League Baseball fans came through the turnstiles this season, marking the 10th consecutive year that the organization has drawn an excess of 41 million fans across its 176 teams and 15 leagues. The number represents increases in both total number of fans (857,413) and percentage of fans (2.1%) from 2013. The 2014 attendance figures follow third only to 2008's all-time record-setting attendance of 43.3 million and 42.8 million in 2007. All of Minor League Baseball's top 10 regular season attendance years have been in the last decade, signaling in part the growth and stability of the organization. 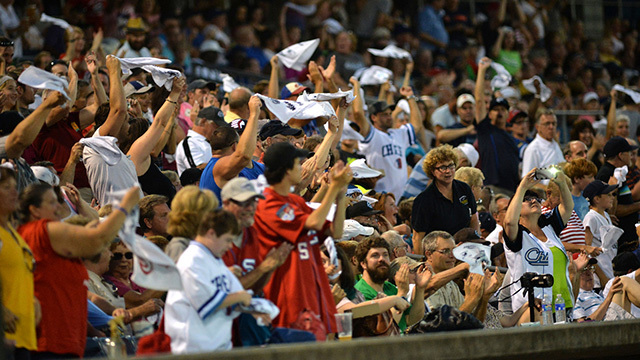 "The fact that Minor League Baseball has recorded its top 10 attendance totals in the past decade demonstrates the cumulative power of the brand and validates our place among recognizable sports properties," said Minor League Baseball president and CEO Pat O'Conner. "MiLB continues to prove year after year that it is a quality product, not just in terms of entertainment on the field, but also as a sound partner in its communities and with both local and national marketing sponsors. The tremendous support of our fans has afforded us the opportunity to accomplish these milestones." The Charlotte Knights led all MiLB teams in attendance, as 687,715 fans visited the newly-constructed BB&T Ballpark this season. The El Paso Chihuahuas played their first game in Southwest University Park on April 28 and drew 560,997 fans in 2014, a record for baseball in the West Texas town. Including Charlotte and El Paso, Minor League Baseball has built an impressive 58 new ballparks since 2000. The attendance leaders in each classification of Minor League Baseball and their overall numbers are as follows: Triple-A - Charlotte Knights (687,715), Double-A - Frisco RoughRiders (449,773), Class A - Dayton Dragons (573,709), Class A Short Season and Rookie-level - Brooklyn Cyclones (231,628).